Thursday, 21st Aug 2014. Palm oil futures is under siege from Bear forces and there is no telling where does this weakness will head next, no promising Support level yet. Other news to follow. "-U.S. stocks closed higher on Wednesday, shaking off a dip that came after Federal Reserve minutes indicated that policy makers talked at their last meeting about a sooner-than-anticipated hike to interest rates. The S&P 500 SPX, +0.25% rose 4.91 points, or less than 0.3%, to finish at 1,986.51. The benchmark index turned negative shortly after the minutes came out at 2 p.m. Eastern, but it bounced back and even briefly traded above its July 24 record close of 1,987.98. The Dow Jones Industrial Average DJIA, +0.35% tacked on 59.54 points, or nearly 0.4%, to finish at 16,979.13, while the Nasdaq Composite COMP, -0.02% edged down by 1.03 points, or less than 0.1%, to 4,526.48. The S&P and Dow have advanced for three days in a row, while the Nasdaq snapped a five-session winning streak." "-Here are the closing levels for Asia's major stock markets: Tokyo (Nikkei Average) flat ; Hong Kong (Hang Seng Index) up 0.2% ; Shanghai (Shanghai Composite Index) down 0.2% ; Sydney (S&P/ASX 200) up 0.2% ; Seoul (Kospi) up 0.1% ; Taipei (Taiex) up 0.5%." "- Crude-oil futures rose Wednesday on the back of data that confirmed a weekly decline in U.S. stockpiles. West Texas intermediate crude for delivery in September CLU4, +2.03% advanced $1.59, or 1.7%, to $96.07 a barrel in electronic trade." 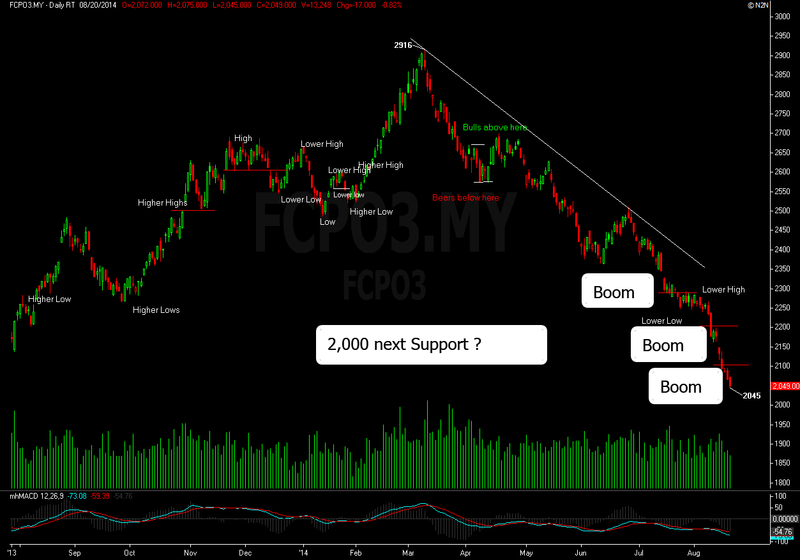 There were many what it told to be a strong support broken when there is a Bearish or worse down trend market. Most traders who would like to counter trend and trade, were getting their best spanking in the market so far. If you were the traders who go Long on those round number support level and yet cut losses or worse yet knowing where to exit your positions, you better deep pocket to cover up your opinion. There is nothing to prove in the market, in fact more to lose if you hold on to your opinion. I bet you have heard "dollar cost averaging," this was the most misleading strategy in my book. Taking more positions just because your cost of obtaining that asset is lower does not answer most of the question later. Piling up your position is a worse thing any trader can do to his risk capital, not knowing where is low would be. Best thing to do when you are trading would be following your initial system or plan and have what it takes to "STICK" with it. Do not change everything when the market is moving against or favorable to you, stick what is already layout plan before you even hit your Buy/Sell position. In the end, discipline and consistency played vital role in any business, especially in financial trading, using your own money as a wager. For today outlook, we are likely looking at temporary recovery amid higher closing value on Soy oil overnight. The most active traded Soy oil contract settled higher at 32.86 cents per pound from previous Wednesday closing at 32.60 cents per pound.For today, pivot support is located around 2,037 while resistance is pegged at 2,086.